Advantech develops a series of edge AI and IoT solutions from edge AI modules, inference systems, wireless modules, wireless sensor nodes, edge computing, wireless ePaper displays to vertical ready solution packages to further accelerate AIoT development and implementation. Powered by Intel® Movidius™ Myriad X VPU and Intel® OpenVINO™ toolkit, Advantech VEGA-300 series provides compact, low power plug-in modules to help accelerate deep learning inference on the edge for a wide range of AI-based vertical applications. Edge Intelligence Server(EIS) accelerates IoT implementation by providing integrated solutions and software modules that enable IoT connectivity, data manageability and analytics in the edge. To fulfill customer requirements in equipment connectivity, data visualization, and predictive maintenance applications, Advantech offers the EIS-D210 Edge Intelligence Server, which is equipped with an Intel® Celeron® Processor N3350 and comes integrated with AWS Greengrass and Microsoft Azure IoT Edge, thus ensuring that IoT devices can respond quickly to local events, interact with local resources, operate with intermittent connections, and minimize the cost of transmitting IoT data to the cloud. In addition to supporting field protocols (MQTT/OPC/Modbus) for sensor/device data acquisition, the EIS-D210 can be used with the Advantech IoT SDK for wireless sensor (Wi-Fi, Bluetooth, LoRa) data integration. Furthermore, the EIS-D210 comes pre-integrated with Advantech’s WISE-PaaS/EdgeSense software solution, allowing users to incorporate sensor data aggregation, edge analytics, and cloud applications for fast and easy real-time operational intelligence. EIS-D210 provides a range of connectivity options with excellent data handling and networking connection capabilities for various IoT applications. EIS-DK10 is a starter kit for jumpstarting IoT applications. It offers a complete solution for IoT data collection and intelligence creation from end device, edge network, to the cloud, and provides clear system architecture based on a speciﬁc user case. EIS-DK10 is a plug & play package with short steps from device assembly to system settings that makes it quick and easy to start building applications.The package includes a ready-to-run system (Intel® Celeron® J1900 platform with WES7), built-in a series of WISE-PaaS IoT software packages, wireless I/O module, sensor, and pre-configured Microsoft Azure service. With it, you can build and land IoT Application with new innovation and easy integration solution. Advantech’s EIS-D150 high-performance EIS is a software/hardware integrated solution offering high computing power for IoT and cloud applications. The unit enables data preprocessing in addition to logic and flow control at the edge of networks. The EIS-D150 comes with a ready-to-run system (6th Generation Intel® Core™ U-series i5 platform with WES7E/ WIN10 IoT Enterprise) and WISE-PaaS software. It includes the IoT foundational block WISE-PaaS/RMM, WISEPaaS/OTA, and WISE-PaaS/Security, as well as the vertical applications WebAccess/SCADA, WebAccess/IMM, and WebAccess/HMI. Furthermore, it gives the flexibility to add other software from the WISE-PaaS marketplace. For IoT developers, the EIS-D150 provides WISE-Agent and a protocol plugin SDK for IoT data collection and conversion, as well as a built-in Node-RED for smart data processing and logic flow design. It comes with preconfigured Azure packages from the WISE-PaaS Marketplace for easy and fast cloud connectivity. The EIS-D150 offers a complete solution for IoT data collection and intelligence creation from end devices and edge networks to the cloud. Its high computing power can assist with efficiently managing various types of devices, equipment, and sensors. With this unit, you can accelerate IoT implementation and enable IoT connectivity, data manageability, and analytics in the edge of your network. EIS-D110, entry level Edge Intelligence Server (EIS) is software and hardware integrated solution for IoT and cloud applications. EIS-D110 offers a ready-to-run system (Intel® Celeron® J1900 platform with WES7E/Win 10 Enterprise) and WISE-PaaS software package, included IoT foundational block WISE-PaaS/RMM, WISEPaaS/OTA, WISE-PaaS/Security and vertical application WebAccess/SCADA, WebAccess/IMM, WebAccess/HMI. User can find more software package in Advantech WISE-PaaS Marketplace. For IoT developers, EIS-D110 provides WISE-Agent and protocol plug-in SDK for IoT data collection and conversion, and built-in Node-RED for smart data processing and logic flow design. It also provides pre-configured Azure packages on WISE-PaaS Marketplace for easy and quickly cloud connection. EIS-D110 offers a complete solution for IoT data collection and intelligence creation from end device, edge network, to the cloud. with it, you can build and land IoT Application with new innovation and easy integration solution. The EIS-D120, a multiple I/O Edge Intelligence Server (EIS), is an integrated software plus hardware solution for IoT and cloud applications. EIS-D120 offers a readyto-run system (Intel® Celeron® J1900 platform with WES7E/ WIN10 IoT Enterprise) and WISE-PaaS software package, including IoT foundation block WISE-PaaS/RMM, WISEPaaS/OTA, WISE-PaaS/Security and vertical applications: WebAccess/SCADA, WebAccess/IMM, WebAccess/HMI. 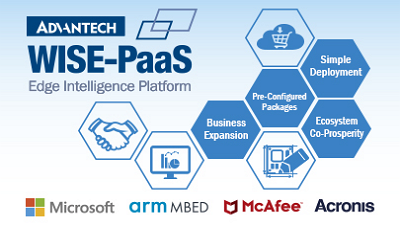 The user can find more software packages in the Advantech WISE-PaaS Marketplace. For IoT developers, EIS-D120 provides WISE-Agent and a protocol plug-in SDK for IoT data collection and conversion, and built-in Node-RED for smart data processing and logic flow design. It also provides pre-configured Azure packages on WISE-PaaS Marketplace for quick and easy cloud connection. EIS-D120 offers a complete solution for IoT data collection and intelligent solution creation from end device, edge network, to the cloud; multiple I/O interfaces help connect with sensors, devices and other equipment very simply. With it, you can build innovative IoT applications that are easy to integrate. Advantech Embedded IoT Gateway series are design with Intelligent Gateway concept. Internet of Things are devices communicate through the network in order to pass raw data to central server for further processing. Advantech developed a series of Intelligent Gateway platforms built with extremely reliable hardware that are efficient and easy to integrate with back-end operating systems. Advantech UTX -3117 is a plug & play IoT gateway to simplify your deployment with multi-connectivity, optimized thermal solution, wide range power input and IoT software integration which is ideal for smart city, smart retail, smart energy and industry 4.0. EPC-R4760 is an ARM based Box Computer powered by Qualcomm ARM® Cortex®-A53 APQ8016 processor that supports full HD display and intergrades on board wireless solution – Wi-Fi, BT and GPS. RSB-4760 also features in mini PCIe, M.2, and SIM card slots for expanding connectivity capability, like 3G, 4G/LTE modules. Equipped with complete Android, Yocto Linux and Debian BSPs, this SBC enables customers to easily develop unique application on specific OS. WISE-3620 is Qualcomm ARM Cortex A based hardware platform, which is operating at OpenWRT, described as a Linux distribution for embedded devices. The Advantech WISE-3620 Industrial Router is Advantech IoT gateway design for smart city, Industrial 4.0 applications, even those in harsh environment, leveraging wireless sensor technology. This IoT gateway can aggregate both the wireless sensor networks (WSN), including 802.11AC MU-MIMO Technology, wired sensors and ties them into an IP network. With modular slot design, it can agilely adapt to a variety of wireless technologies at regional RF bands, wireless communication protocol by various uplink requirement and quickly go to market. WISE-3610 is Qualcomm ARM Cortex A based hardware platform, which is operating at OpenWRT, described as a Linux distribution for embedded devices. The Advantech WISE-3610 Industrial Router is Advantech IoT gateway design for smart city, Industrial 4.0 applications, even those in harsh environment, leveraging wireless sensor technology. This IoT gateway can aggregate both the wireless sensor networks (WSN), including Low Power WAN (LPWAN) technology by Advantech private LoRa technology, wired sensors and ties them into an IP network. With modular slot design, it can agilely adapt to a variety of wireless technologies at regional RF bands, wireless communication protocol by various uplink requirement and quickly go to market. Advantech IoT Gateway Starter Kit created in collaboration with Intel® and Microsoft®. This kit will jumpstart your IoT innovation with a reliable platform and open gateway technologies. The whole package includes a ready-to-run system (Intel® Celeron® J1900 platform & Windows 7 Embedded), IoT software platform service (WISE-PaaS), development kit and technical support service, and Azure service certification and integration. With it, you can take your IoT innovation to market faster and create new business value. Advantech RISC-based WPAN Network Controller, WISE-3310, is powered by the Freescale i.MX6 Dual Cortex-A9 1.0 GHz processor, Linux 3.10.17 BSP and Linear Dust LTC5800 Cortex M3 MCU with Smartmesh core technology for IEEE 802.15.4e standards. With changeable embedded modules and feature-rich protocol, WISE-3310 creates a cost-effective open platform for easy integration and development in different M2M/IoT applications. Also, it is integrated with WISE-PaaS/RMM for IoT Software platform to complete and streamline the IoT solution, from sensor to cloud. Advantech provides different wireless sensor nodes such as LoRa, Bluetooth, WiFi, NB-IoT and Sigfox that can support multi-interface, data acquisition, power management and flexible configuration for diverse applications. WISE-1510 is M2.COM standardized IoT Sensor Node integrated with ARM Cortex-M4 Processor and LoRa transceiver to support public LoRaWAN or Proprietary LoRa private networks (w/ WISE-3610 LoRa IoT Gateway). Based on the deployment, WISE-1510 is durable to support LoRaWAN public network or private LoRa Eco-system. LoRa technology is the great for Low-Power Wide-Area Network (LPWAN) Applications such as Smart Cities, Agriculture, Metering, Street Lighting and Environment Monitoring. With optimization on the power consumption and wide range, yoursensors or applications with low data rate requirement can be achieved years battery lifetime and kilometers long distance connection. Advantech WISE-1510 also provide multi-interfaces for sensor and I/O control. With ARM mbed embedded microprocessor operating system and add-on software stacks, it's convenient to support IoT communication protocols including LWM2M, CoAP and MQTT with WISE-3610 LoRa IoT Gateway. Data can be quickly and easily acquired and transformed into a different format to communicate with WISE-PaaS, mbed Cloud or other cloud services. Developer can build their application backbone faster and focus on their applications, value-added services. WISE-1520 is the first wireless sensor node for M2.COM family. It’s integrated with ARM Cortex-M4 Processor and low power Wi-Fi connectivity fully compatible with existing Wi-Fi infrastructure. It’s convenient to build the industrial IoT applications environment with M2.COM compact design. WISE-1520 also offers certification ready to save RF testing costs and software development kit including sample code, sensor driver API, utility and RTOS for the embedded microprocessor operating system. With built-in WISE-Agent, WISE-1520 can communicate directly with WISE-PaaS/RMM Cloud platform for remote monitoring and management by widely-used IoT communication protocol – MQTT. Data can be quickly and easily acquired and transformed into a different format to communicate with WISE-PaaS or other cloud services. Developer can build their application backbone faster and focus on their applications, value-added services. WISE-1510 is a wireless module integrated with ARM Cortex-M4 Processor and LoRa / LoRaWAN connectivity. This technology is the best solution for Low-Power Wide-Area Network (LPWAN) Applications. LoRaWAN is defined to optimize the power consumption and wide range. Your sensors or applications with low data rate requirement can be achieved years battery lifetime and kilometers long distance connection. Advantech WISE-1510 also provide multi-interfaces for sensor and I/O control. With ARM mbed embedded microprocessor operating system and add-on software stacks, it's convenient to support multiple IoT communication protocols including LWM2M, CoAP and MQTT. Data can be quickly and easily acquired and transformed into a different format to communicate with WISE-PaaS or other cloud services. Developer can build their application backbone faster and focus on their applications, value-added services. WISE-1530 is a wireless module integrated with ARM Cortex-M4 Processor and Wifi / BLE connectivity. This technology is the best solution for WIFI and BLE combo Applications. For example, we may use BLE to configure device and transfer mass data through wifi connectivity. You may choose the WIFI or BLE to submit your sensor data according to different scenario and purpose, such as the short range with low power consumption or mass data rate to complete the specific task. Your sensors or applications with low data rate requirement can be achieved years battery lifetime in short range communication BLE. Advantech WISE-1530 also provides multi-interfaces for sensor and I/O control. With ThreadX v5.6 microprocessor operating system and add-on software stacks, it's convenient to build the application software or sensor algorithm over the OS. Data can be quickly and easily acquired and transformed into a different format to communicate with WISE-PaaS or other cloud services. Developer can build their application backbone faster and focus on their applications, value-added services. WISE-1540 is M2.COM standardized IoT Sensor Node integrated with ARM Cortex-M4 Processor and Dust’s time-synchronized SmartMesh networks. With time slotted channel hopping (TSCH) link layer, all nodes are synchronized to within less than a millisecond. Time in the network is organized into time slots, which enables collision-free packet exchange and per-transmission channel-hopping. All nodes within SmartMesh networks could route, source or terminate data while providing years of battery powered operation. SmartMesh Networks are the great fit for Industry 4.0 Applications to deliver a highly reliable network in the most challenging RF environments such as Machine diagnostics, Factory Automation, Environment Monitoring and ProductionEfficiency. In the SmartMesh network, every device has one or more parents which provide redundant paths to overcome communications interruption due to interference, physical obstruction or multi-path fading. If a packet transmission fails on one path, the next retransmission may try on a different path and different RF channel. Developer can be easily to extend the network coverage via SmartMesh. Advantech WISE-1540 also provide multi-interfaces for sensor and I/O control. With Arm mbed embedded microprocessor operating system and add-on software stacks, it's convenient to support IoT communication protocols including LWM2M, CoAP and MQTT via WISE-3310 Mesh IoT Gateway. Data can be quickly and easily acquired and transformed into a different format to communicate with WISE-PaaS, Mbed Cloud or other cloud services. Developer can build their application backbone faster and focus on their applications, value-added services. WISE-1570 is M2.COM standardized IoT Sensor Node integrated with ARM Cortex-M4 Processor and NB-IoT or LTE-M technologies. 3GPP (3rd Generation Partnership Project) has defined NB-IoT (CAT-NB1) and LTE-M (CAT-M1 or eMTC) in release 14th. The purpose of new standard is to fulfill the demand of IoT growth. NB-IoT and LTE-M focus on LPWA market with wide coverage, more connections, lower data rate and better power consumption. Telecoms will be easier to build NB-IoT or LTE-M network with existing LTE infrastructure. This new standard expedites the penetrations of internet-of-thing in China, Asia, Europe and Untied States. Advantech WISE-1570 also provides multi-interfaces for sensor and I/O control. With Arm mbed embedded microprocessor operating system and add-on software stacks, it's convenient to support IoT communication protocols including LWM2M, CoAP and MQTT-SN to NB-IoT or LTE-M service network offered by telecom companies. Data can be quickly and easily acquired and transformed into a different format to communicate with WISE-PaaS, Mbed Cloud or other cloud services. Developer can build their application backbone faster and focus on their applications, value-added services. WISE-DB1500 is an evaluation carrier board designed for the M2.COM module. It is compatible with the M2.COM module WISE-1520 and has rich I/O interfaces for evaluation and development. WISE-DB1500 is an ideal development board for evaluating IoT applications, such as sensor node, smart metering and control node.WISE-DB1500 is released along with M2,COM carrier board design documents: Carrier Board Design Guide, Layout, Schematic Checklist, and also the reference board schematics are ready for you to start your own carrier board design. WISE-1020 series is a wireless IoT node with Linear/Dust Network ARM Cortex-M3 Processor, which is a self-forming and self-healing mesh network complaint to 6LoWPAN and IEEE802.15.4e standard. With time synchronization, channel hopping and full mesh network, it offers wire-like reliability and the world’s lowest power WSN solution. Advantech Wireless IoT Node, WISE-1021, features a highly-integrated, low power radio with self management and IP network. With time synchronization, channel hopping and full mesh network, it offers wire-like reliability and the worlds lowest power WSN solution. Adding powerful MSP-430 processor, it is able to provide the multiple sensor interface, TI-RTOS, APIs for time-to-market integration. WISE-1251 is a RS-422/485 extension board of WISE-1021. It is with 3500 VDC Isolation protection and -40 to 85° C wide temperature design; it is the most reliable industrial wireless IoT RS-422/485 solution . WISE-1252 is a 4-ch Relay and 4-ch DI extension board of WISE-1021. It can support 3500 VDC Isolation protection and -40 to 85° C wide temperature. It is the most reliable industrial wireless IoT Relay and Digital-input solution . Advantech Wireless Module Solutions include BT, WLAN, 3G/4G and GPS modules, which combine embedded modules with software as package for embedded vertical applications that SI and IPC vendors can easily implement wireless functions into their own applications. With Advantech Wireless Modules, system integrators and industrial PC vendors can easily implement extra wireless functions into their own system or board level applications. Advantech's wireless IoT incorporates industry-leading RF specification and features such as 802.11 ac wave2, MU-MIMO, 802.11AX, and LTE CAT4/CAT6 /CAT9, to empower the newest wireless high data throughput solutions. Users can access their web and cloud application information through our high performance wireless solution to make sure their system will keep operating at its optimum performance. Advantech provides diverse GPS modules types including A-GPS, GLOSNASS, Beidou, QZSS and Galileo for various applications. Advantech provides 802.11ac/a/b/g/n modules from signal band to Dual band WiFi with miniPCI-E or M.2 form factor. The embedded wireless modules are realy for multi-bus interface at different OS. Advantech also provides Bluetooth 4.2 which customers exchange data from fixed and mobile devices, creating Personal Area Networks (PAN) with high levels of security. Advantech provides multi type LPWAN RF module solution for various IOT applications. EPD-023/53/130/132 is the module which support ultralow power 2.4GHz RF wireless protocol integrated with EPD in Arm processor. The module can support hospital ,pharmacy, factory, warehouse ,retail and transportation application. With optimization on the power consumption and device management, Advantech EPD tag can be achieved years battery lifetime and thousand devices connection. EPD-023 is the module which support ultralow power 2.4GHz RF wireless protocol integrated with 2.9" EPD in ARM Cortex-M3 processor. The module can support hospital ,pharmacy, factory, warehouse and retail application With optimization on the power consumption and device management, your applications with low data rate requirement can be achieved years battery lifetime and thousand devices connection. Advantech EPD-023 provide multi interface for application control which is highly integrated with EPD driver and low power consumption system. EPD-023 support Zigbee software stack protocol which can auto join and binding the network group with WISE-3241 IoT Router and Advantech IoT Gateway. Data can be quickly and easily acquired and transformed into a different format to communicate with ePaper Manager Server. System integration and End system can focus on application development and system management. EPD-053 is the module which support ultralow power 2.4GHz RF wireless protocol integrated with 5.65" EPD in ARM Cortex-M3 processor. The module can support hospital ,pharmacy, factory, warehouse and retail application. With optimization on the power consumption and device management, your applications with low data rate requirement can be achieved years battery lifetime and thousand devices connection. Advantech EPD-053 provide multi interface for application control which is highly integrated with EPD driver and low power consumption system. EPD-053 support Zigbee software stack protocol which can auto join and binding the network group with WISE-3241 IoT Router and Advantech IoT Gateway. Data can be quickly and easily acquired and transformed into a different format to communicate with ePaper Manager Server. System integration and End system can focus on application development and system management. EPD-130 is the module integrated with 13.3" Red/Black/White and Black/White EPD. The module support micro USB and SPI interface for host computer to control the EPD. EPD-132 is the module which support ultralow power 2.4GHz RF wireless protocol integrated with 13.3" Red/Black/White and Black/White EPD in ARM Cortex-M4 processor. The module can support hospital, factory, warehouse and retail application. Advantech EPD-132 provide multi interface for application control which is highly integrated with EPD driver and low power consumption system. The model support WIFI/BLE software stack protocol which can easily configure and then join the network. Data can be quickly and easily acquired and transformed into a different format to communicate with ePaper Manager Server and then to other application services. System integration and End system can focus on application development and system management. Advantech provide 13.3”EPD EVKs using Wifi, and developer can easily start design with our design-in service. We also provide ePaper Manager , WISE-3641/3241 and EPD EVK to start evaluate the deployment process without any obstacle. The EVK is for new user to experience how computer to control the ePaper and then wireless send image to control board. On the other hand, we also provide the demo kit to include SW & Gateway for user to learn how to deploy the solution to their project.